Draft 5 is now available. Drafts 4 is still supported but not in active development. Please look for the free download of Drafts 5 using the developer link on this page, or visit getdrafts.com for more details. 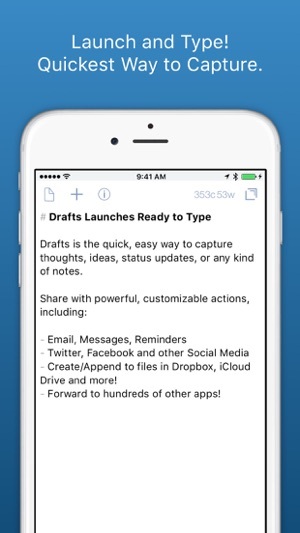 NOTE: Drafts 5 is now available. Visit getdrafts.com/upgrade for details. - **New:** Support for new watch face complication types on the latest Apple Watches. - **New:** Support for the newest iPad screen sizes. Obviously I'm in the minority because I do not use the popular markdown features but it is great for jotting down quick notes that one can save or send as emails, messages, social media posts and even add tasks to Omni Focus. You can use it as a search engine, dictionary, thesaurus, and in conjunction with other apps to create larger, more elaborate compositions. Drafts is really very versatile and there is really no other app that can currently match Draft's abundance of features. The app is also universal which is a huge plus if you toggle back and forth, like myself, between my iPhone 8 and iPad Pro. *UPDATE: Already a whole year since the last review and still, as always, this app is best in class and I try new productivity/note/journal/ writing apps on almost a daily basis and run them through all of the important tests and use Drafts as the measuring rod. For big epic ramblings you want to jot out before sending it as text to be formatted elsewhere or simple notes, messages, emails, social media posts and todos, Drafts has you covered. The keyboard is best in class as well and for those that don’t want to be distracted by toggling around for characters, this keyboard beats them all. This app is my main driver! I use it for everything. It’s so versatile, especially coupled with TextExpander. Much like a card dealer, it captures everything in one hand (metaphor) and deals the cards of information wherever they need to go. All my personal clubs and professional meeting notes, conversation logs, text messages originate from here. And when my meetings have Tasks that need to move to my task manager software, I use it for that too. It’s MUCH faster than Evernote in creating and formatting a note (using markdown feature to make it pretty). So, I craft my notes here and then send them to Evernote as my repository. As a person that uses an IPad for most of the day (recording meeting notes, crafting proposals, managing tasks and scheduling meetings), I’d say that Drafts is a must have app for productivity. I’ll bet I’m only using 50% of what its capable of doing. It’s on my phone and iPad Dock because its so useful. © 2012-2018 by Agile Tortoise, Inc. All rights reserved.